Mailchimp's recent brand redesign captures all the whimsical qualities the company is known for and gives them room to expand their offerings and connect with even more small businesses. 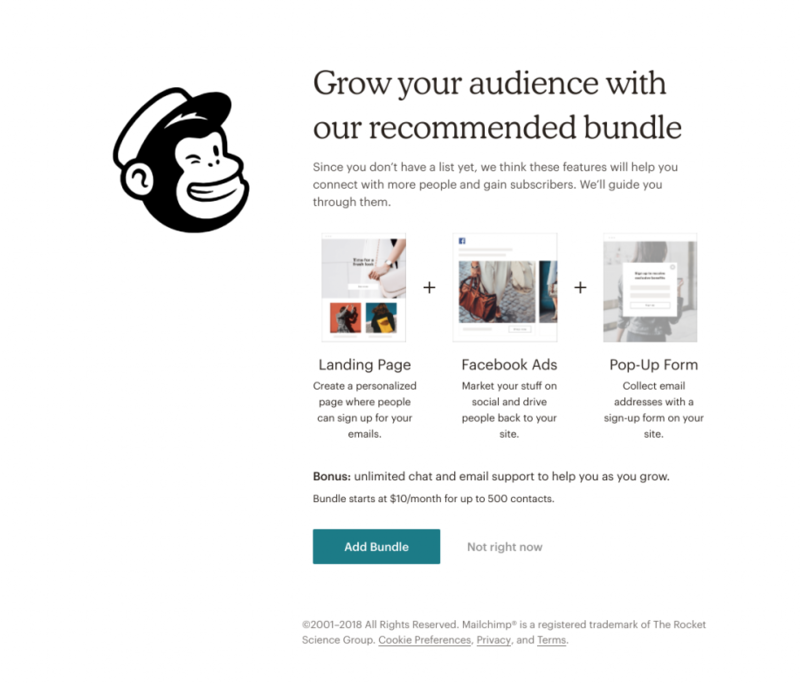 While many companies struggle to adapt their tools when creating new products and features, Mailchimp's onboarding sequence perfectly fits their new look, guiding their customers to the right services they need to grow their reach. 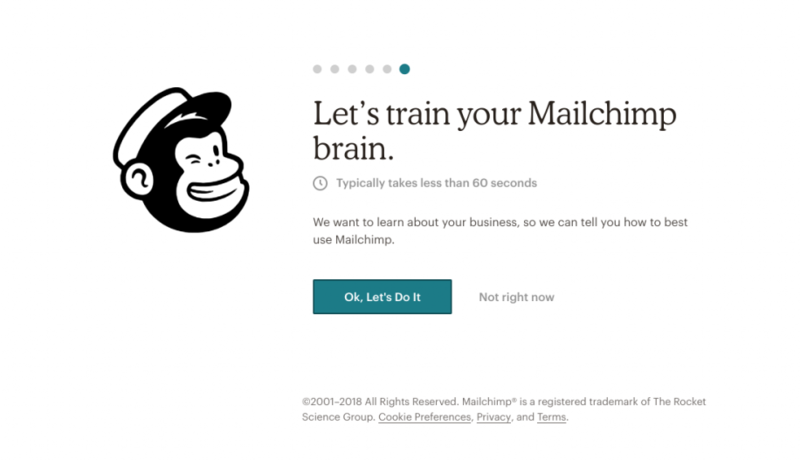 After registering for a free account, new Mailchimp customers are guided toward an optional onboarding sequence to “train their Mailchimp brain,” a task that should take most users less than a minute to complete. 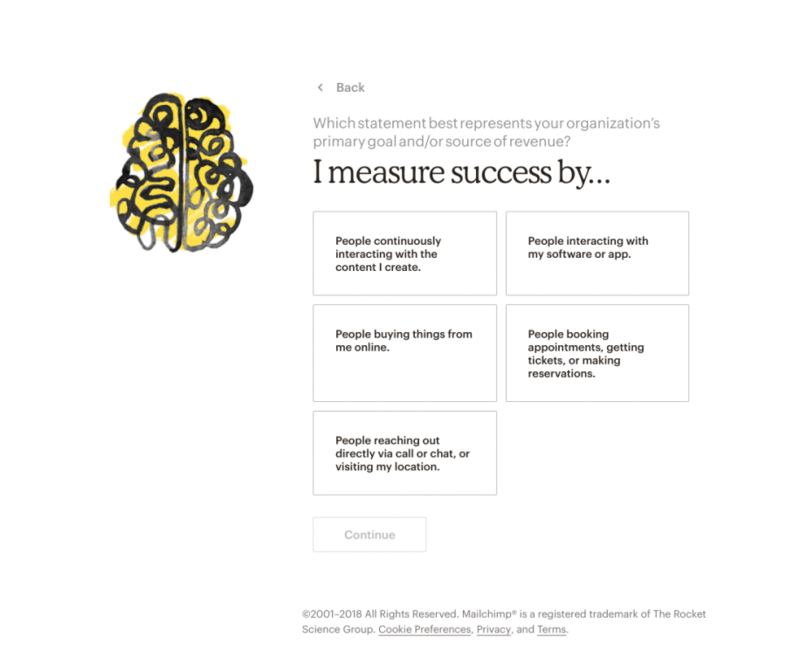 The questionnaire asks users some straightforward questions, focusing on their business needs over the features of the tool. 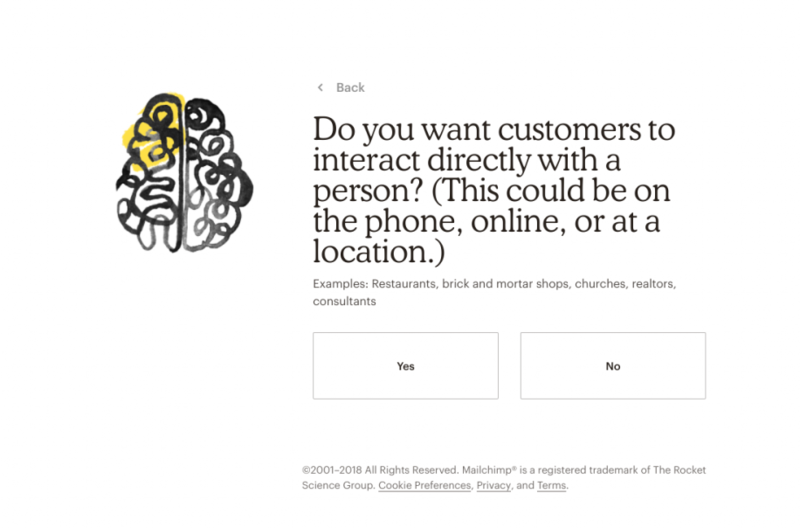 After the questions are completed, the users' answers are used to build custom recommendations for how to best use the service. New Mailchimp users have no experience with the product or its features—they simply need to solve the problem of growing their audience. 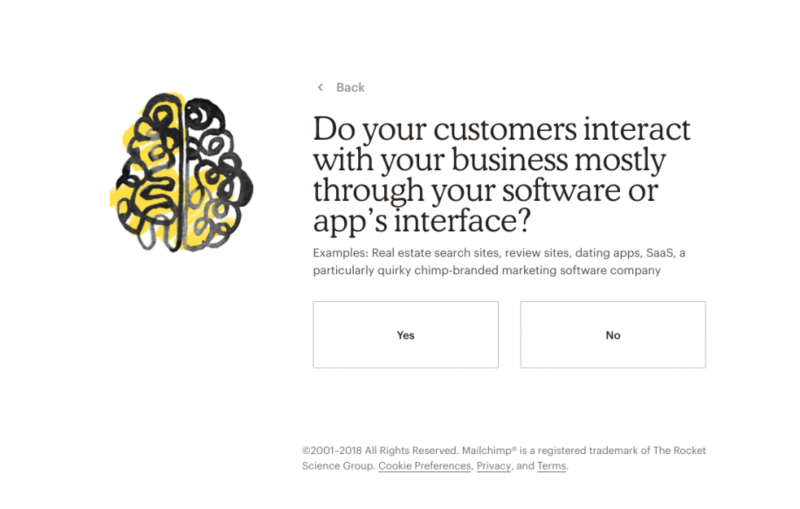 Mailchimp's onboarding questionnaire asks simple questions about users' businesses, guiding them to the right solution for their specific needs without exposing users to the product before they're ready. 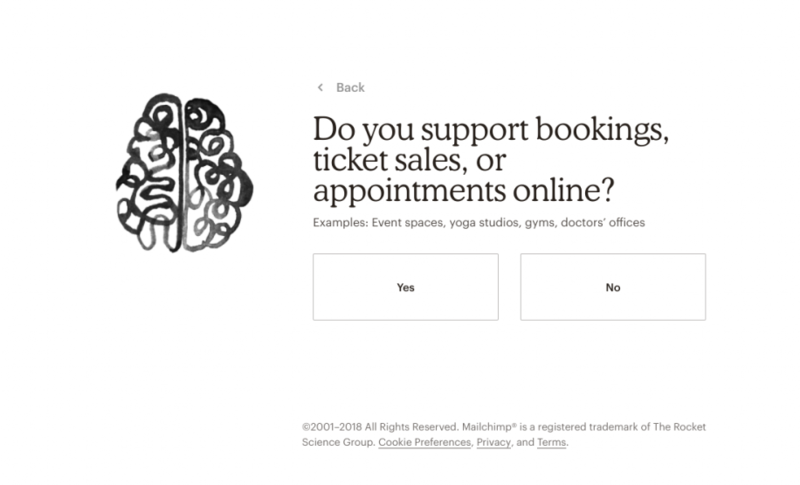 Mailchimp's clear UX copy and illustration sequences help inspire confidence in users inexperienced with using marketing software, walking them through the setup process and clearly explaining how their recommended solution will help customers grow their audiences. It's just plain fun. 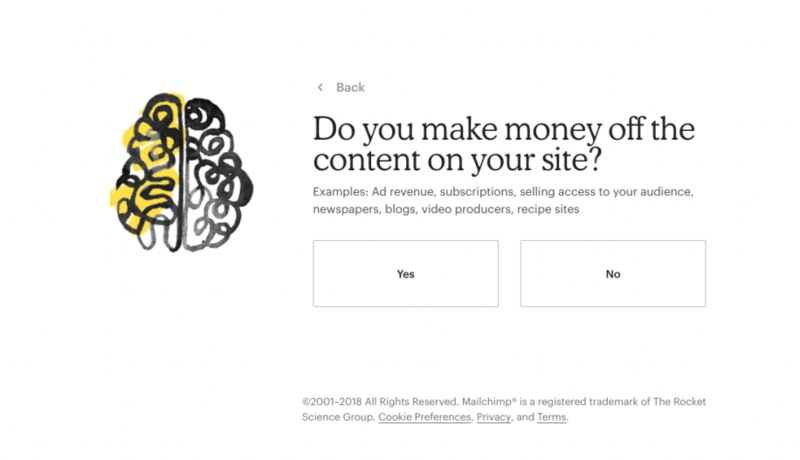 Mailchimp's endearing imagery delights users, framing users' first impressions as a positive experience, and ensuring that they keep coming back for more.